I was excited about the 2018 Women’s March. 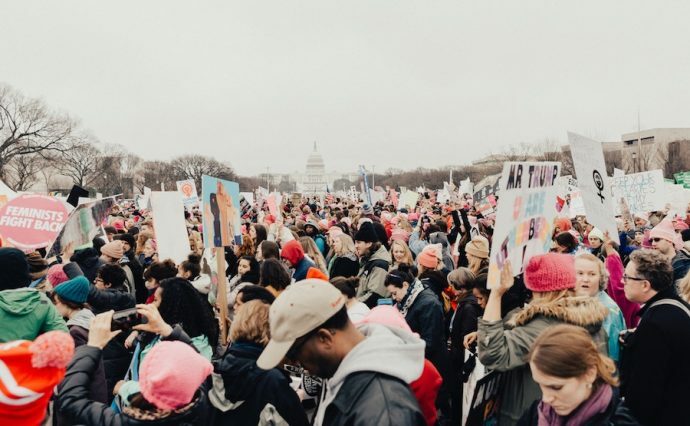 I had seen the images from the rather spontaneous 2017 Women’s March on Washington, and I was excited to march in my city. I’m not extraordinarily political nor would I call myself a “social justice warrior.” I’m a short, roundish, forty-nine-year-old housewife who is probably a lot like other roundish housewives in the country. I was moved to march, I think, as a celebration of being a woman, raising kids, working, surviving menopause, and enjoying friends. I wanted to celebrate being a woman, and I wanted to celebrate with other women. The week before the march, however, I started to have some feels. The feels rose up and lodged in my head and they wouldn’t leave. Suddenly, going to the march became a “thing” and it got bigger and uglier as it rattled around in my head. Thankfully, a dear friend jerked me out of my head, made me a sign to carry, and told me that I was going to that march! That’s how I found myself in a crowd of thousands with a giant sign proclaiming my introvertedness. This is where the story descends to the fifth circle of hell. You see, that sign was big, well-designed, and definitely eye-catching. The moment I raised that sign, cameras turned my way. Cameras of all shapes and sizes, cameras on phones, cameras on tripods, even news cameras. People were nudging each other and smiling, angling around for a good photo of that sign. And who was attached to that sign? Me. An introvert. Obviously, I survived that day because I’m writing this article. It would be hard to write an article if I were dead. How did I survive, you ask? I employed a time-tested, well-worn tactic of mine. Diversion. Well, diversion and awkward humor. When someone came to me with a huge smile and a “I love your sign!” I automatically pointed to my friend and loudly proclaimed, “She made it!” Their attention diverted to my friend and I could breathe a sigh of relief. In all fairness, she did design and make the sign. I merely carried it. I can claim no credit. The awkward humor came next when I blurted out, “I just wanna go home.” There’s not much conversation to be had after a misty-eyed introvert begs to go home. 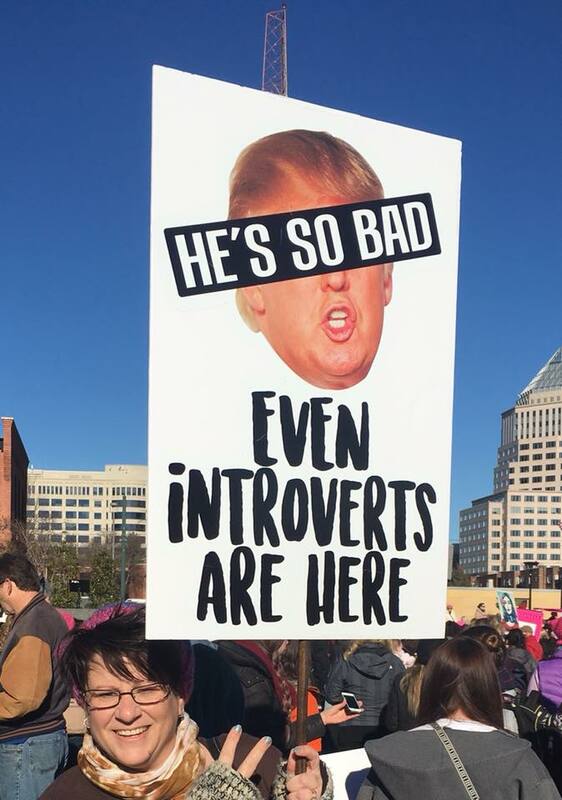 Would This Introvert March Again? I employ the diversion tactic a lot. The tactic takes the attention off me and places the attention on something else. Instead of being the focus of conversation, I’m shifted to the periphery and I’m much more comfortable. Having the “diversion tactic” tool in my toolbox enables me to attend functions more confidently. Before I arrive at the venue, I mentally rifle through my toolbox of coping mechanisms. I see that I have my diversion tactic tool, I take a deep breath, and I confidently slide to the back of the room. The day after the march, I was enjoying my well-deserved introvert cocoon day. I had wisely pre-planned my cocoon day because the introvert hangover is a real thing. I know myself well enough to plan a day of rest and rejuvenation after any intense social interaction. Cocoon day is luxurious and indulgent, and I try not to ruin cocoon day with any guilt for needing it. I wear my softest fuzzy pants, burrow under my warm blanket, and sip many cups of hot tea. I try to avoid all verbal communication on cocoon day, but my husband gets cranky when I respond to him with a baleful stare. I was ready to reflect on my experience at the march. Even though it exhausted me, would I do it again? Absolutely. Even though it drew a lot of unwanted attention, would I carry another big, eye-catching sign again? Absolutely. Because, most of the time, I feel profoundly out-of-step with the world. I feel like there’s some kind of marching beat that carries people and helps them march in unison. Only this introvert can’t hear that beat. So, while they are all smiling and moving together, I’m bouncing around like a rabid ping pong ball. On that day, though, during the march, I came together with thousands. Now, I can’t say that I finally heard that elusive marching beat. What I will say is that it didn’t matter. It didn’t matter what marching beat anybody heard. It didn’t matter that our steps didn’t match. The beauty of that march was the cacophony created by thousands of different marching beats being joyfully held in one space together. That sense of unity and togetherness is so rare for my introverted self. And that sense of moving together is the reason I’ll be there next year. Artist, introvert, and navel gazer. The life of a contemplative is the life for me. I throw in some dirt and growing things along with a good cup of coffee, mix well, and I thrive.